If getting web apps running in the cloud sometimes feels overly complicated look no further. Flynn is the open source turnkey solution to the cloud, containers, and everything needed for running applications in production. Installing Flynn onto a cluster allows anyone to deploy, run, and manage web applications in the cloud right from their own terminal. This guide will help you get started with Flynn by explaining the required steps to installing and configuring Flynn CLI locally as well as the Flynn host services in the cloud. Following these instructions enables you to set up your personal Flynn cluster with all the benefits and none of the work or complexities usually associated with a production ready environment. Running your own Flynn cluster allows you to easily deploy applications to the cloud straight from the codebase. To do this, you will first need to install the Flynn CLI which is used to control the cloud hosts at the backend. The Flynn client is available on a number of different operating systems. Below you can find the one-liner commands to installing it on Linux, macOS or Windows. Install the Flynn client on your own computer. Linux or macOS systems, use the following command in a terminal. On Windows, run the command underneath in PowerShell. Once the installation has finished, you can test that the client was configured successfully by checking the software version number with the next command. You can then continue by deploying new cloud servers to create your Flynn cluster. Login to your UpCloud control panel and select Deploy Server under the servers menu. Enter a domain name and a description, then select the availability zone and configuration you wish to use. Flynn recommends running the nodes with a minimum 2 GB RAM and 2 CPU cores. Select the Ubuntu 16.04 template for out of the box compatibility. Then in the Miscellaneous settings, include an SSH key for easier and more secure access to the node. Once you have made the required configurations and selections, click the Deploy button at the bottom of the page to start the cloud server. Repeat the above steps to deploy as many servers as you wish to include in your cluster. The minimum multi-node cluster size is three, but it is possible to operate Flynn host on a single server as well. There are two available ways for installing Flynn on a host or cluster in the cloud. For the easy option, Flynn provides a straightforward web browser installer for setting up the server software on any number of nodes. 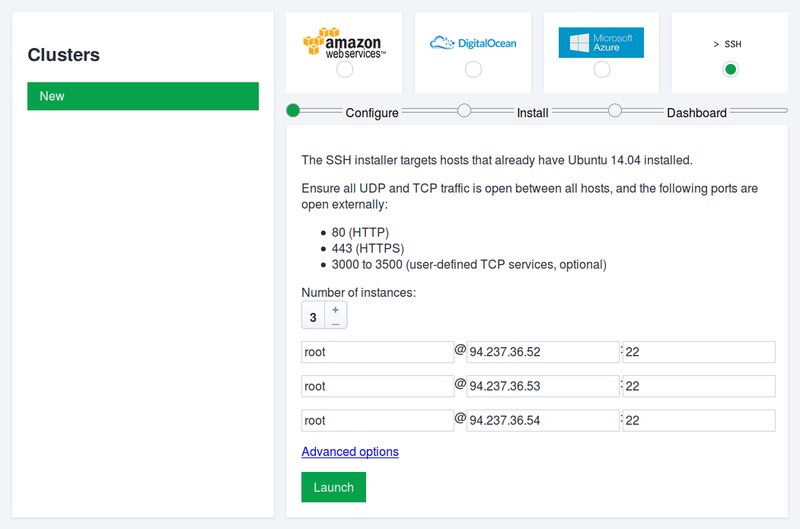 Simply set up an SSH connection method for the servers, after which Flynn will run through the installation automatically configuring and bootstrapping the cluster ready to use. The other option is to take a hands-on approach by manually installing the Flynn host services. Doing the installation yourself allows you to check through the install scripts and configure a custom domain if you have one available. 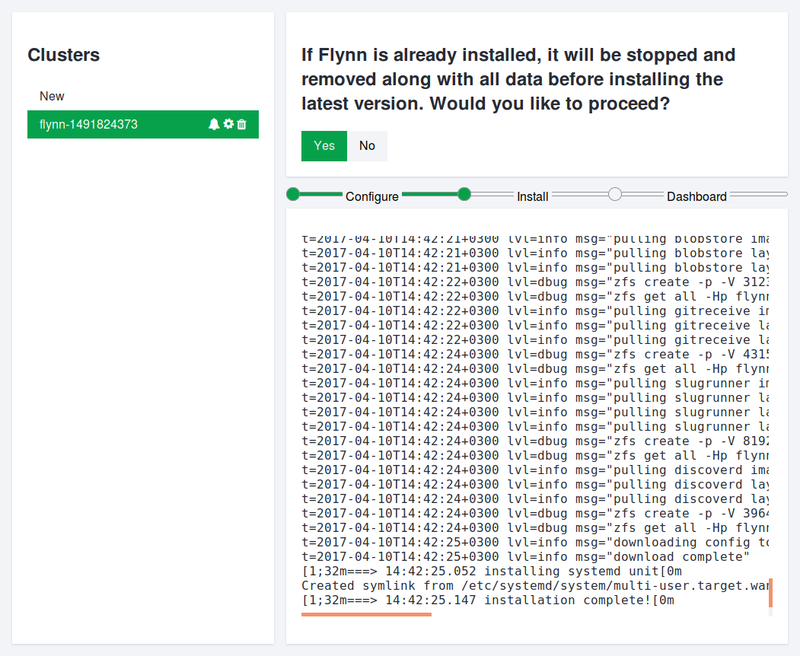 Regardless of the install method you choose, you can have a Flynn cluster up and running in a matter of minutes. Installing Flynn to your cluster using the web installer is very simple. With the Flynn CLI installed on your computer, run the following command in a terminal or PowerShell window. This starts the installer and opens the configurations in your default web browser. Select the SSH option at the top right corner of the page, then enter your cluster details to the list of instances. Set the number of instances to match your cluster and include each node’s IP address once on the list. After entering your node connection details, click Launch to begin. If you included an SSH key to your cloud servers at deployment, you can use it for authentication during the installation by having it open in your SSH-agent. In case the key is not detected automatically, include it by selecting the Private Key option, adding an OpenSSH compatible key, and providing the passphrase when asked. If you did not configure SSH keys for the cluster, use the Password authentication option and enter the server root password for each node when prompted. Once the installer has successfully authenticated to the nodes in your cluster it will begin installing the host software. Click Yes once for each node in your cluster to confirm and proceed with the installing Flynn. 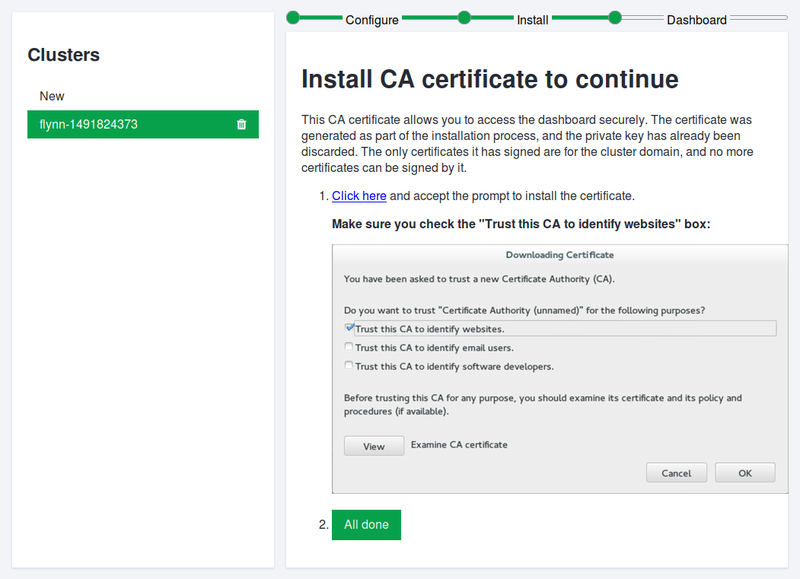 After the cluster has been configured, you will be asked to install a CA certificate which is required to accept the self-signed certificate the dashboard uses. Follow the instructions show in the web installer. With the certificate installed, click the Dashboard button to continue to the Flynn control panel. You should get logged in automatically. If you need to relog to the dashboard, you can retrieve the login token using the following command on your own computer. Setting up a Flynn cluster with the web installer configures and bootstraps the cluster ready for applications. You can now continue to deploying a test app. Installing Flynn manually allows you to use your own domain name for the applications. If you do not have a domain name easily available, you should use the web installer and let Flynn assign a domain to your host or cluster. Configure your domain name on a DNS as shown below. Include A records pointing to each of the nodes and a CNAME record as a wild card for the cluster domain. As DNS records might take a moment to propagate, therefore it is good to get these done early to avoid unnecessary waiting later on. Next, login to your new servers and run the usual updates to get the nodes prepared. Then download the Flynn install script and run it with the command below. You can verify the install was successful by checking for the version number. Repeat the steps above to install Flynn on every node that you want to include in the cluster. With the Flynn host services installed on the cluster, it is time to get them connected. Flynn provides a discovery system that allows servers to find each other using a generated discovery token. On one of the nodes in your cluster, generate a new token with the --init-discovery flag. Then configure the discovery token on the rest of the nodes with the command below. Replace the <discovery token> with the whole URL given by the init command above. Once all of the nodes have been configured to use the same discovery token, start the host services on every node with the next command. With the nodes up and running, you can bootstrap the cluster with a single command on one of the nodes. The node used here will become the default cluster leader and is used to schedule jobs on nodes across the cluster as required. Include your custom domain by replacing the <flynn.example.com> and replace the <discovery token> with the same URL you just generated. If the bootstrapping was completed successfully, you will see a confirmation along with a command to add your cluster to the Flynn CLI on your own computer. Follow the instructions and run the command in your terminal. You can verify that the cluster was added to the client and set as the default with the following command. Also at the end of the bootstrapping output, you can find a link to your dashboard and the login token needed to sign in. If you lose your login token, it can always be retrieved with the command below on the Flynn CLI. In case the bootstrapping fails, check that the DNS records are available on your nodes and that the host service is running, then try the bootstrap command again. Application deployment and general management on Flynn revolve around the ease of use. Developers can deploy applications with a single command straight from git, while the databases, service discovery, scheduling, containers, routeing, and cluster management are all taken care of in the background. Now that you have your Flynn cluster up and running, you should take it for a spin by deploying a small Go example application that runs a minimal HTTP server and talks with a Postgres database. Start by downloading the demo application using Git clone with the command below. If you do not already have Git installed, you will need to get it set up before continuing. Change into the downloaded directory. Then create a new application on Flynn. Doing so adds a new Flynn Git remote which you can verify using the following command. Each application should also have a default route that can be seen with the next command. While much of the database operations are performed automatically, you will still need to create one for the applications to use. The preparations are then complete and you can deploy the application to the cluster using the next command. At the end of the deployment output, you should see a confirmation of what was deployed and where. You can then open the application URL in a web browser or use curl as shown below to test the application by replacing the <flynn.example.com> with the cluster domain. Great, the example application is working and responding correctly. One of the main advantages of a cluster is redundancy in multiple replicas of the services, but the application is currently running only a single instance. To increase the number of instances, use the following command. If you now refresh your browser window or run the curl command as above a couple of times, you should see replies from 3 different container IDs. Congratulations, you should now have a production-ready Flynn cluster at your disposal. Next, you might want to look into deploying your own applications on Flynn. To find out more about Flynn and its advanced features, check out the Flynn application documentation pages. Flynn also gets better every day as they track the infrastructure space and regularly integrate new components and features. New and modern technologies are often quickly available without the users needing to figure out how everything fits together. So keep your systems up to date and you will always have the latest and greatest that Flynn has to offer.